So continues the story of Patriarch Jan Vyborny, as told by his son. At that time my father sold out his holdings, and in 1851 abandoned Bohemia. After 7 weeks on a sailboat of an unpleasant voyage, arrived successfully to New York, from where he set out at once further west to Wisconsin, coming to Milwaukee, where he stayed for a while. He understood German well, and there were many Germans here already, so that he could converse almost everywhere, and things were not the worst for him. He did not however know just what he should start to do. His intentions were to purchase some-land; upon which a German offered to sell him 40 acres about a mile from town for $600, but he did not like this because about a half of it was a swamp. At that time Milwaukee was a small town. I believe that at the present time it would take somewhat more to purchase that same 40 acres. Father traveled about 40 miles further west into the center of the state, near Watertown in Jefferson County, which was then also only a small town. He liked it quite well and also found several Czechs there such as the Nevdicek brothers and Kviz, who found salvation after 48 years in America. Furthermore Jos. Matak, Jan Jerich, locksmith; the Hus brothers who were, brewers; Prochaska and several others. This also consoled him, that he would again be among his own countrymen, and he immediately bought. 40 acres of land near the town, along the main road by a river where there already was a flour and saw mill and also a distillery. He erected a structure, bought a pair of oxen, a wagon, cows and other agricultural necessities, all that he needed for farming, and was prepared to exact a livelihood in the new land. After all these expenses, he had $300 left. He had his eldest son Joseph learn the blacksmith trade; John the next son in bridle-making, and with the rest of the family wished to live in contentment on his settlement. His contentment did not last long, because a short time later he burned out completely, since the house caught fire at night when they all slept. He and his wife remembered to save their children, who they led out first. Then realizing that the youngest boy was upstairs father rushed back through the smoke and carried him out. Again he risked going back into the building to save some of the property, and threw whatever he first came across out of the windows; some feather quilts, a Czech cut glass mirror, a Czech clock even after stepping on it and some books. He however forgot about the trunk where he had money and clothing, and so the structure with the rest of the furnishings and money burned to the ground. How the fire ignited cannot certainly be said, only that later it was explained that a Czech family lived with us, and the lady arose during the night and took the ashes out of the stove into a basket which she set near a wooden wall and some clothing in the kitchen, wanting to cook some hot cereal for a child. It is fortunate. that nobody lost their life or was injured only that that father and his entire family were left almost naked and hungry without anything except the bear burned ruins; the last reminder of his property and happiness. Some of them raked over the ashes attempting to locate the lost money, but we do not know if any was found or not. Then what was he to do? He went to town to look for work and see if he could make a loan on credit. He went to an American named Ritchl, who was about the wealthiest citizen there. He owned the flour and saw mill, and also a store. He graciously accepted him, gave him work at the saw mill with his team, and right. away a voucher in advance for flour in the mill and the store for clothing and other needs which eliminated initial shortages. He was also given trimmings and left-overs from the saw mill for erecting a new abode. As soon as he erected and occupied the home, he started working off the debt at the saw mill, which took quite a while as he also had to earn a livelihood before he began to reap from his small farm, where after his first harvest things were not so bad. After that they had things for living, and could also sell off something, so that he did profit some. He soon erected a new suitable residence, later a small barn and threshing floor where they still threshed with flails and cleaned grain according to the Czech style, as at that time there were threshing machines. Grain was cut with scythes, raked, tied on the ground, and threshed with flails as it was done in the old days. He lived here for some time quite satisfied, as there was not only an increase in farming but also in the family because in 1853 I was born into the family. In 1854 however, their peace was again disturbed, because their only daughter died, which caused great sorrow to both parents. After that, in 1856, a son Miloslav was added to the family, so that their family then consisted of seven sons. The area was rapidly getting populated and the town grew. More Czechs also came. Mr. Vojtech (Albert) Naprstek, who he knew from during his stay in Milwaukee, often visited them, and father grew to know him well.. Naprstek wanted to publish a Czech newspaper, which they planned to found with shares, some of which father held, as well as some of the other countrymen. However, there still were not that many Czechs. Among those who were, there was little wealth and little confidence, so nothing came of it. Shortly after that, Mr.Naprstek started to publish the "Flag Blatter" in the German language, to which father subscribed, and we still have a few issues to this day. Living close to town, due to the fellowship for his sons, soon became distasteful, and then too, he had little land for the growing family, so near the end of 1857, he decided to leave Watertown, and took a look into northern Iowa with his eldest son Joseph in January 1858. There was little snow, and they went on foot. Through Wisconsin the road was quite fit, in places good, in places poorer, and it was quite cold. It grew worse for them when they crossed the Mississippi River, and they came to the plains of Iowa, as there was more snow, and a strong northwest wind almost continually lashed at their faces, so that travel was cruel. There were few homes and seldom a town, however the worst for them was lodging, for they often came to a farm late in the evening and requested lodging, but were rejected, that there was no place for them. When they went to the next, were told that a member of the family was ill, so that they were compelled to go further tired and hungry, until they obtained a place to sleep at some German's place. They very seldom stayed at an American's place. The travel through Iowa went very slow. It also, occurred that one person- who caught up with them, and was going the same way with a team and wagon, father asked him for a ride, as the wagon was empty, but he refused, and would not take them even for pay which father offered. One day his son Joseph was so tired out, that he could hardly continue, so that father had to support him before they arrived at a town, where they obtained nourishment and rest. The next day they set out on a longer road westward, so that until after 20 days of travel they arrived at Osage, Mitchell County, where they rested for a few days, for they were very tired after such a long,trip in those days. They then went about four or five miles up along the Cedar River to the tom of Mitchell. They liked the lay of the land, as there were nice level prairies, along the river. There also existed nice forests of various trees, such as oak, ash, both black and soft walnut and maple. That appealed to father right away, so he purchased 80 acres of land from one farmer for $450, and 5 acres of forest for $50, as at that time land and forests were cheap. At the present time the farms there sell from $30 to $50 an acre, and a nice forest for as much as $100 per acre. After the purchase they set out on the return trip, which was not so uncomfortable, as they went more with the wind, and the weather was a bit milder, so that toward the end of February they successfully returned home. After so much suffering, and from the bitter cold, in a short time, father broke out with over 30 boils at one time, so that lie could hardly move, and this lasted for a month and a half before his health was restored; after which lie sold out his property near Waterton. Early in April 1859 he loaded the heavier furniture into a large wagon, put the bedding and clothing into a smaller one, where mother and I rode, as I was only 6 years old, and where with the younger Miloslav, they placed us into the featherbeds. They hitched up two teams of strong oxen to the large wagon, one horse to the smaller one, and with the entire family consisting of the parents and seven sons, four already full grown, we set out from Watertown westward to Iowa, like the Israelites going to the promised land. One other countryman was prepared to travel with us, and was prepared for this trip in a similar manner as we were. The roads were poor, almost everywhere it was swampy, and the weather rainy, as it usually is in the spring, so our progress was very slow and disagreeable, because we were often stuck. Some days we did not travel more then one mile or two, or so; others again perhaps 25 miles, according to how dry the roads were, and according to the weather. We cooked outdoors, driving stakes into the ground, placed a rod over them, hung a kettle on it to make a fire, and our kitchen was ready. We slept in the wagons, and along the way shot wild ducks and geese, as there was an abundance of game. After an entire month of travel we arrived to the smal1 town of Mitchell, which consisted of only a few residential structures, a store and a blacksmith shop. There they obtained a log cabin to live in, however it was no comfortable palace, as there were holes in the walls, so that a dog did not have to think much about where to jump out, because he had plenty places. The roof was such in name only, because when it rained, only whoever crawled under the table did not get wet, as it poured in so that everything got thoroughly soaked. After that we made ready to settle on the land which father had purchased, where there was only a simple structure without a floor, which we hastily repaired and moved into. A part of the farm was under cultivation, and this was seeded. Our traveling companion lived with us. In the spring a flood carried away the flour mill sluice in Mitchell, as well as other places along the river, and we exhausted our flour and food supplies, so that father was forced to take the oxen and wagon, and with one son set out on the road to Decorah, 70 miles distant, for flour, and was also to bring flour for the countryman who lived with us. Wherever they went, rains had came and the rivers and streams rose taking away bridges, where-ever they were. They rarely found one, and father could not return at once, and our flour was completely gone. There were no potatoes, but our countryman still had one full sack of flour. Mother asked him for a loan of some flour, that perhaps father will return soon, but he did not want to loan her any flour. When she asked him the second time, he told her off sharply, that she should go with the rest of us to graze in the prairie, that 'there was enough grass there'. At this, two of the older brothers were forced to go among the neighbors to see if they could get some flour. They did not obtain any until after almost an all day effort, they succeeded getting 50 pounds of corn flour, for which they had to hoe corn two days for this American who had given them the flour. Father however, returned soon, and the misery ended. He did have a sharp discussion with the countryman in regard to that insensitive scene, but he nevertheless gave him the flour which he had brought for him. After that the countryman moved further northwest to Minnesota. At that time there were no Czechs here except a man named John Hejny, who, lived with his family in the town of Mitchell, but who shortly after moved further west to the neighboring County of Worth, and we were again left alone among Americans, so that our parents were quite lonesome. They were nevertheless made happy because they had the family all together. It was different for the rest of us, as we knew English well. The older brothers continued to go and work for wages, and father with the younger ones worked the farm, plowing sod or breaking the prairie and at the same time renting other farms. We lived on the rented place, as on the farm we owned we did not have sufficient living space, and we were short of money that we could not build anything better, because grain was cheap and required going a long distance to sell it. We had to haul everything way to McGregor, which was something over 100 miles away, and when you took a load of wheat which was of good quality, you had to sell it for 35 or 45 cents a bushel, and a dressed hog from 2 to 3 cents a pound. When one hauled a load of grain there, which took from 14 to 20 days there 4nd back, then one bought some coffee, sugar and a barrel of salt, and was cleaned out again, so that the return load was light, and one did not have to fear that somebody would rob him, as a per son received almost nothing for his work except a living, which was wretched at that, because grain was still cut with hand scythes. Crops of course were good, as wheat produced 20 to 35 bushels per acre, regardless of how sown, because we dry our grain with harrows that had wooden pegs instead of metal, and our wheat still produced 35 bushels per acre. Regardless of all the shortages we were quite happy, because we were all together. One day my oldest brother Joseph went to Mitchell where he met a stranger with a cane in his hand. He addressed him in every possible way, but he did not understand English, and along with that he stunk from a polecat which must have sprayed him. He kept mentioning Mr. Hejny, however, my brother could not understand anything else. Then my brother addressed him in Czech, in case he might be a Czech, and he joyfully replied in Czech: "May a thunderbolt strike you, you are a Czech, I greet you with God." They talked more, he said his name was Korn, had come from Chicago, and was looking for Hejny. They came home to our place, where we changed his clothes from that stench, and he told us about this animal he had met on the road, that it was very tame, and when he came close to pet it, that it sprayed him properly with it's perfume. The next day was Sunday, and my brother found a large hole in the ground not far from our buildings. Thinking that it was a badger they began digging with shovels. When they dug about 7 feet, they saw they were near the animal. Korn was curious to see how they will catch the animal, so squat in front of the hole on the dirt pile, and here in a short while the animal rushed out of the hole over the dirt pile between Korn's legs, and sprayed him anew with a stinking fluid, because it was again an unfortunate skunk, so that he stunk again, and we had to redress him once more into different clothes. A short time later he set out on the road to again look for Hejny. Our domestic content did not however last long, because in 1861 the Civil War broke out, and everything was in turmoil. Wherever there were people, meetings were held, one, giving the other courage. 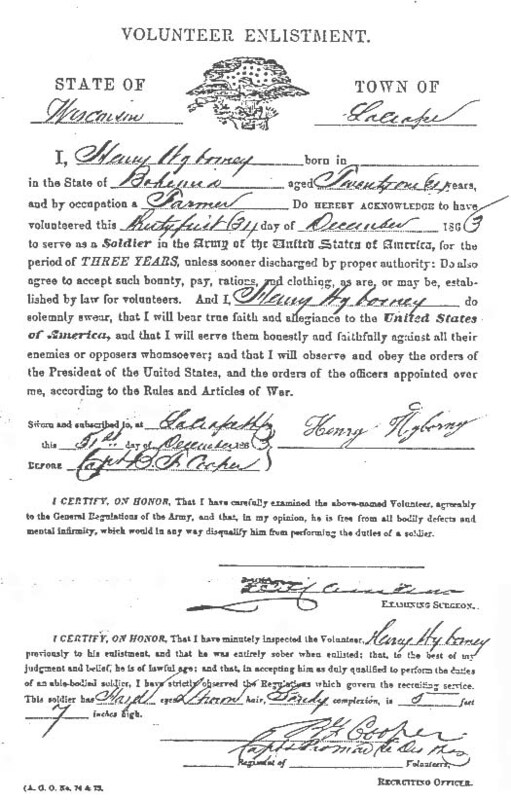 Enlistments into the army were made continually, arid right off early in 1861 my oldest brother, Joseph enlisted also into the First Iowa infantry Regiment, which our parents did not like, to see at all. However he was not there long, as after his military training he took part in the first battle near Blue Mills where he was seriously wounded, as a shot shattered his knee, so that he spent a long time in the hospital. As if this was not enough, early in the winter of 1862 my youngest brother Miloslav became sick and died after only a brief illness. This unspeakably tormented my parents, but who could help it ? -this was fate. After that in 1862, the third oldest brother, Vaclav, left for Eau Claire, Wisconsin, and took up 160 acres of government land, and worked in the pine forest. Shortly after that Joseph came home a miserable cripple, as his leg was not totally healed, requiring our parent, to care for him in great sorrow, because he had to walk on crutches, and we had to wait on him. Following that, I think it was toward the end of the year 1862, the Indians rose up in Minnesota, as is well known. They were still however far away from us, but many runaway people passed by our place, as the farm where we lived was situated on the main road. Many went in wagons along with their cattle, so that this went on day and night. The Indians set fire to the forests in Minnesota, and a great deal of smoke came with northwest winds, so that one could only see a short distance on the road, and this scared even our neighbors, who loaded up their wagons with what they could, and wanted to run away. However, after we convinced them that the Indians were still a long ways away and would not come this far, we did hold them back. In Mitchell preparations were made for defense. 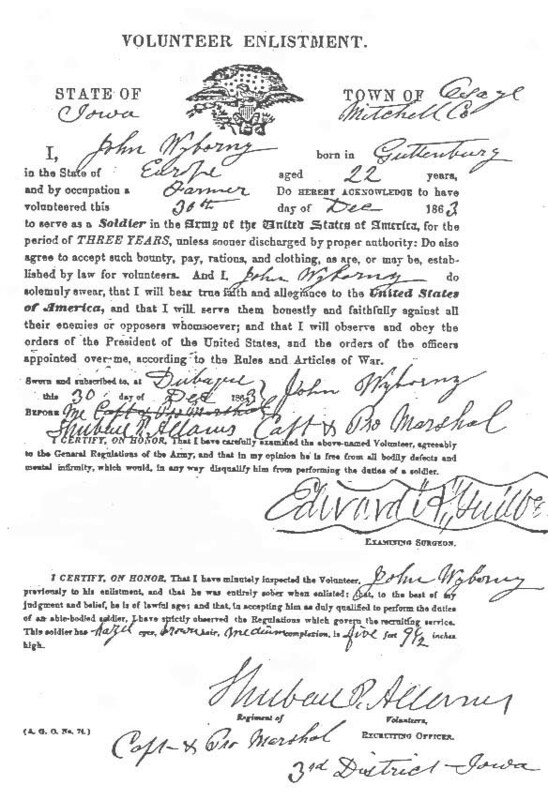 volunteering into the Fourth Regiment of the Wisconsin Infantry. The others had volunteered into the Fourth Regiment of the Iowa Cavalry, what was odd about this was the fact that Vaclav in Wisconsin volunteered on the same day and month as his brothers at home, even though they did not correspond about it. Shortly after, they were enlisted, and it was with great pain that our parents saw them leave, but they had to submit -to what was prepared for them by fate. 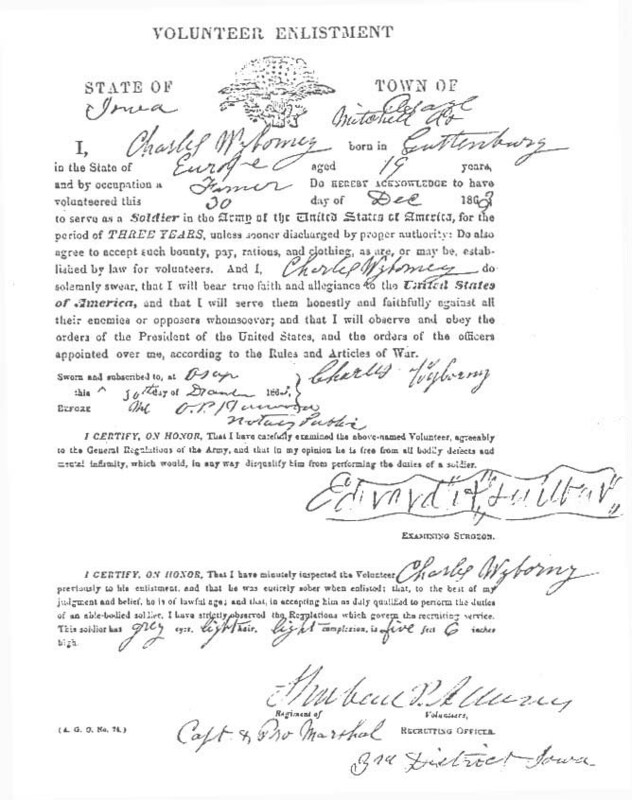 John and Charles left with other recruits to Memphis and Vicksburg, where they were assigned into the army. Soon after that, Charles was sent to Chicago with rebel prisoners. The weather was bad as it was cold and rainy, and he caught a bad cold, so that before they returned by way of the Mississippi River, he became sick, and after a short time in the hospital in Vicksburg, he died. This was a crushing blow to both parents, because then they thought that not even the others would return in good health, as John and Charles were their pets. Mother could not hold out against these cruel blows of fate, and became ill. There were no Czechs here who could cheer them up a little, and they knew very little English, although Americans visited us often and offered their sympathy, until finally toward the end of 1864 a Mr. Machacek, father's brother-in-law, came here with his family. Only then were our parents a little happier. The fortunes of war served the remaining brothers better, as after participating in many battles, they got out unharmed, although we did not hear from them often, especially about Vaclav, because he was with General Sherman on his campaign through the last states to the ocean, so that after participating in many violent battles during which he suffered hunger to such a point that when corn was given to the mules puling their wagons, the soldiers stole the corn, leaving the mules to roar with hunger. He was nevertheless quite fortunate that lie did not come to any harm. One time he did have a close call when a bombshell flew in but did not explode at once, but burrowed into the ground and only then exploded, throwing him with others to the ground with little harm to any of them. When they passed through the last states, and were marching from Richmond to Washington, where he was discharged the latter part of July 1865, he came home right during harvest. To this day I can see him, as I met him on the road walking from Mitchell in his army uniform, big army boots, with which he marched through the mud of the last states, and all dusty just like when he left the army, however, very thin. Soon after that the war ended in 1865, and John also came home just in time for harvest, although somewhat ill, but he grew healthy soon, so we became very happy that all are home again except Charles, whom our parents could not very easily forget. Then one after another they married and started to make a livelihood for themselves. Mother however did not regain her health, in fact it worsened, so that after almost three years of illness, she died on Feb. 8, 1867. In total deep sorrow we buried her in Mitchell along side her youngest son. Father lost his faithful life companion, which was such a great sorrow for him, that although he was a man of firm character, became ill. He soon became well again, but not altogether. After that John moved to the neighboring county of Worth, where he lived on his own land. Vaclav moved to his own land in Wisconsin, and Joseph not far into Minnesota. Father lived on the farm with Frank, who worked the farm, however even he started his own livelihood, and father was left almost by himself, so in 1870 he married again, rented out the farm, and lived on happily in his second marriage. In about a year he sold the farm in Mitchell and moved to his son John near Plymouth, where he lived with him for some time. Then the idea came to him to go further west into Dakota, where his brother and his nephew were in the Czech community of Bon Homme County, and there to take up free government land, waiting there until after a time when land prices would go up. He urged John and Frank, telling them that I will also go, and we will settle there together again. This was agreed upon, and so in the spring of 1872 they set out on the road, but when they got there, the soil did not appeal to them. The prairie was nice and leveled but the soil too dry and gravely. This did not appeal to John and Frank, so they did not want to settle there but father settled there anyway because he thought that I as the youngest would settle there with him. He took 160 acres of government land, erected a log cabin, bought a span of oxen, a grass and grain mower and other needs, then asked me to come there too, so I set out along with one cousin. When we arrived we saw poor grain, as it was too short. I found out right off that the soil was not fertile, because I knew that it was gravely and dry. My cousin took up 160 acres and started plowing because it was toward, the end of June 1872, with which I helped him. We had a sharp plow, but before we went about 100 rods the plow became dull so that we could not hold it, in the ground. I did not like this in comparison to the fertile Iowa soil, and could not see much of a promising future in it so a short time later I went back, having to harvest the grain and with the understanding with my father, that I would not come to settle there. Father stayed longer, but toward the close of harvesting, when they were stacking- grain, who do we see coming up the road in a covered wagon but my cousin with whom I had gone there, because lie was returning to Iowa. In the second year, when father saw nobody will be coming to be with him, he wrote asking me to come and get him, that he changed his mind, and would not stay there alone. So after a year, and a half of his stay in Dakota, I went there for him. He ceded his claim to another Czech there, and exchanged his cabin for a span of oxen. I loaded up his paltry belongings into the wagon, hitched up two pair of oxen and set out with them on the return trip. After thirteen days of travel, I found myself again with our wanderer, home near Plymouth, where he satisfactorily resided for the remainder of his life with his son John or among us. Father was however continually sickly, because he did have an accident on the way to Dakota. As his wagon passed in and out of some deep ruts, he was slightly injured and perhaps was even more scared, so that his ailment only worsened. He failed rapidly until he quietly died on July 24, 1874, and to our sorrow and that of the entire community laid him to eternal rest in the cemetery at Mitchell next to mother and our youngest brother. The attached article written originally in the Czech language by VRATISLAV VYBORNY about his father JAN (John) VYBORNY, was composed of very long sentences and no paragraphs. In the translation, I have done everything possible to keep the exact meaning of what the original writer said in Czech, but shorter sentences were used in English, and the article was divided into paragraphs for the sake of easier understanding by the reader. No special attempt was made for grammatical correctness, but the translation is typed with space and a half to aid in editing, should any member of the Vyborny family intend to use any part of this story in future publication. It would appear the VRATISLAV VYBORNY who wrote the original article in Czech, was a cousin of the JOSEPH VYBORNY who was the first mayor of the Town of Tabor, S. Dakota (Grandfather of George & Joe E. Vyborny and their sisters). I gather this because when JAN VYBORNY, father of the writer came to the Dakota Territory in 1872, the article states that he had a brother and nephew here. The brother, quite certainly would be JOSEPH VYBORNY SR., died in 1878, and who is buried in the Catholic cemetery in Tabor, and the nephew would be George's grandfather JOSEPH VYBORNY, born 1828 and died in 1908; also buried in St. Wenceslaus cemetery at Tabor, S. Dakota. There was a VRATISLAV VYBORNY who was a charter member of the Town of Tabor, S. Dak, and is listed on the original plot of Tabor as such. This would very likely be the writer, as in the article he writes that he was in the Tabor community in the spring of 1872, which was when the town was founded and plotted. His father, I am told, settled on the farm presently occupied by the Leonard Souhrada family, just northwest of the George Vyborny farm. I was not told, nor could detect exactly when the article was written, but in the closing paragrapht Vratislav does state that he and some of his brothers are still engaged in farming. This and other comments would indicate that it perhaps was some time about the turn of the century. 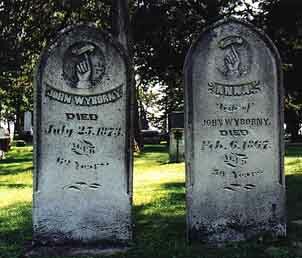 Photo of graves of John and of Anna, Mitchell, Iowa. "At the end of the same year 1874, Brother Vaclav (of Wisconsin) sold his farm in Wisconsin and moved closer to Brother Joseph near Lyle, Minnesota - just 20 miles from my family. We are still living close to Plymouth in Worth County, Iowa. My brother Jan became seriously ill in 1879 and died October 12 1880. He was buried in the Mitchell Cemetery near our parents. He left behind his wife and six small children. Each of us have acquired a farm, but farming is a poor way of making living because everything we grow or raise sells so cheaply, like it was before the war. We do not have too far to go to market. We now have three railroads within five miles. There are also quite a number of Czech families around Plymouth and Manly Junction. We do not belong to any organization or have meetings or societies and mostly live by ourselves." Leigh Wyborny recently found the missing paragraphs of Laddie Kostel's translation.